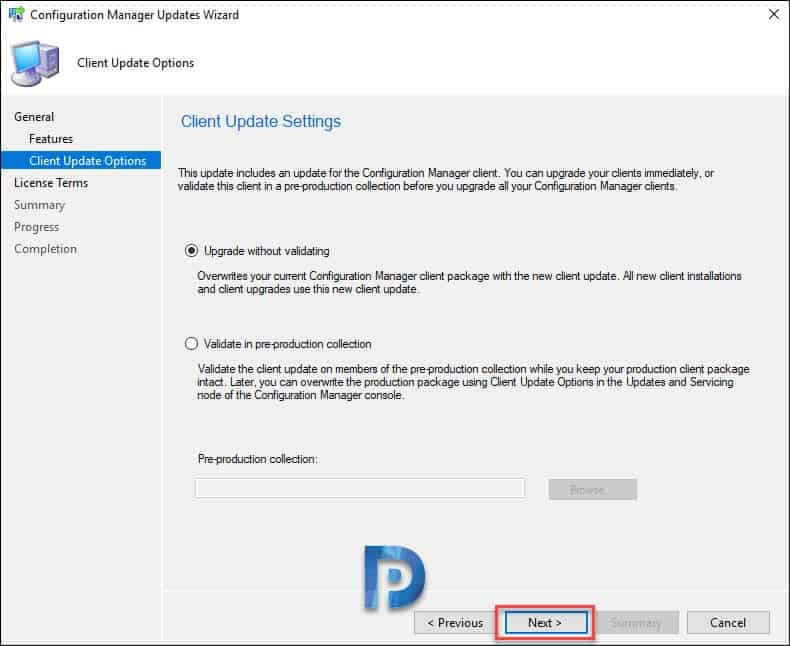 This post is a SCCM 1902 upgrade guide. Microsoft released the first SCCM version i.e. SCCM 1902 today. 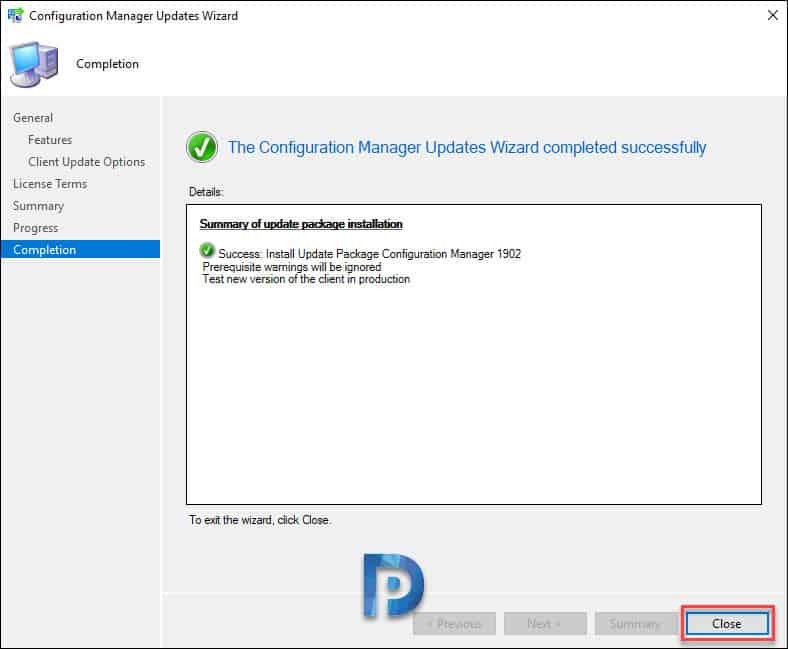 The Configuration Manager 1902 is out and comes loaded with new features and improvements over SCCM 1810. Most of all you can begin upgrading your SCCM current branch setup to version 1902. I can see lot of user voice items have also been baked in SCCM 1902. So pretty much excited to upgrade my Configuration Manager current branch to version 1902. 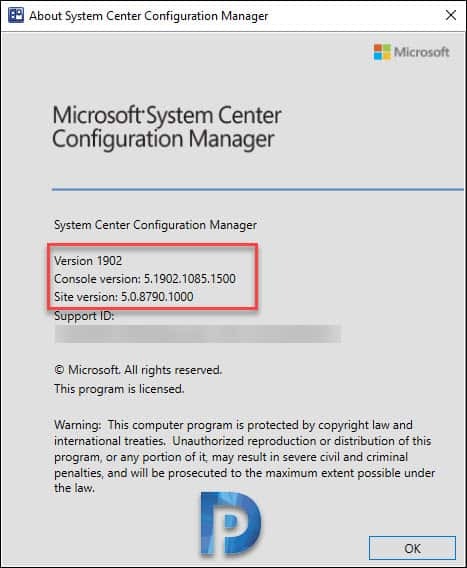 You can read about all Configuration Manager 1902 features here. This SCCM 1902 Upgrade guide will be part of my SCCM current branch guides as well. Click here to download all Configuration Manager current branch guides. Should I install SCCM 1810 Hotfixes first ? Here are some of the SCCM 1902 prerequisites that you need to look into before you install SCCM 1810 update. To install ConfigMgr 1902 update, you must have installed at least SCCM 1802 SCCM 1806 or SCCM 1810. In my lab setup, I had to run a fast update ring script to quickly get the 1902 update. The PowerShell script can be downloaded by clicking this link. I am sure this is one of the question that comes to mind before installing version 1902. There were several hotfixes released for SCCM 1810. Each hotfix came with certain fixes and probably you may not have installed any or installed just few hotfixes. If you are installing update 1902, then you can skip the hotfix installations. The fixes that these hotfixes contained are already included in 1902 update. In my lab setup notice that I upgraded to Configuration Manager 1902 directly from Configuration Manager 1810. I did not install any hotfix and yet the upgrade was successful. Therefore if you have already installed all the hotfixes, you can still install update 1902. Here are the list of SCCM 1810 Hotfixes. Back to main topic. After running the PowerShell script, I had to restart SMSEXEC service and I could see the Configuration Manager 1902 update. Before installing the update, I ran a prerequisite check. Almost everything was good but I could see just one warning. Potential SQL server performance issue caused by change tracking retention period. Warning – Configuration Manager detects the site database has a backlog of SQL change tracking data. I have blogged about this warning in this post. Navigate to Administration > Overview > Updates and Servicing Node. 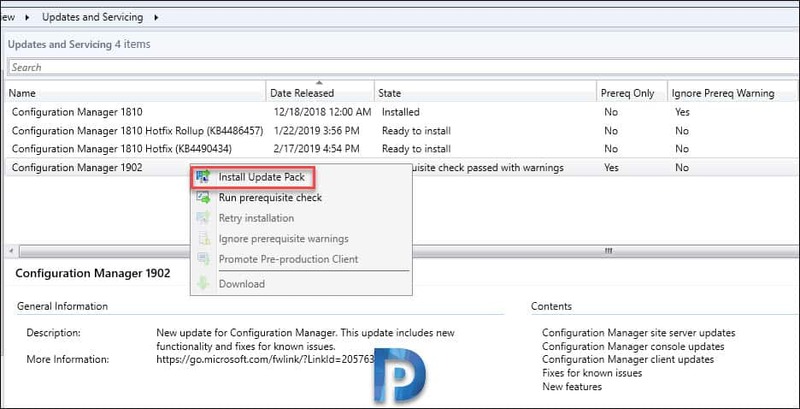 Right click Configuration Manager 1902 update and click Install Update Pack. I will check the box “Ignore any prerequisite check warnings and install this update regardless of missing requirements”. Click Next. Choose either Upgrade without validating or validate in pre-production collection. Click Next. Click Next on remaining pages and finally click Close on Completion page. 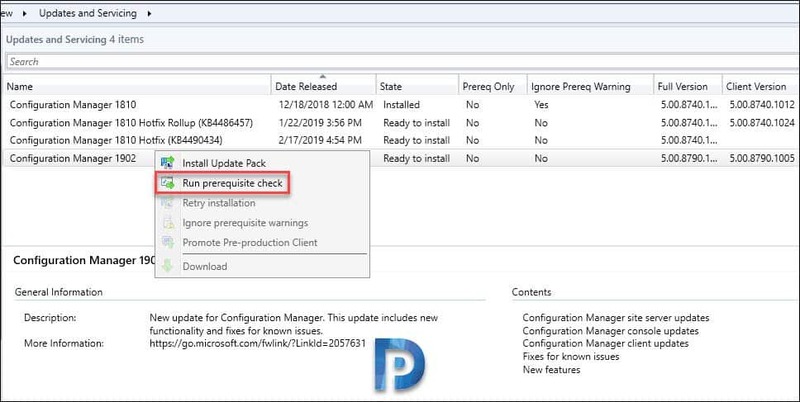 While the SCCM 1902 update is installation, you can monitor installation progress. Click Overview > Updates and Servicing Status. 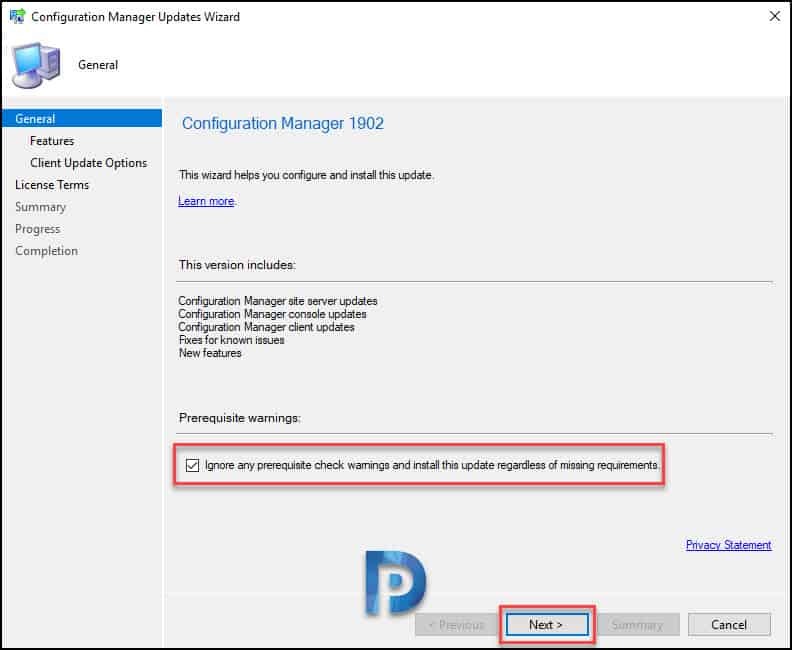 Select the Configuration Manager 1902 update and click Show Status. 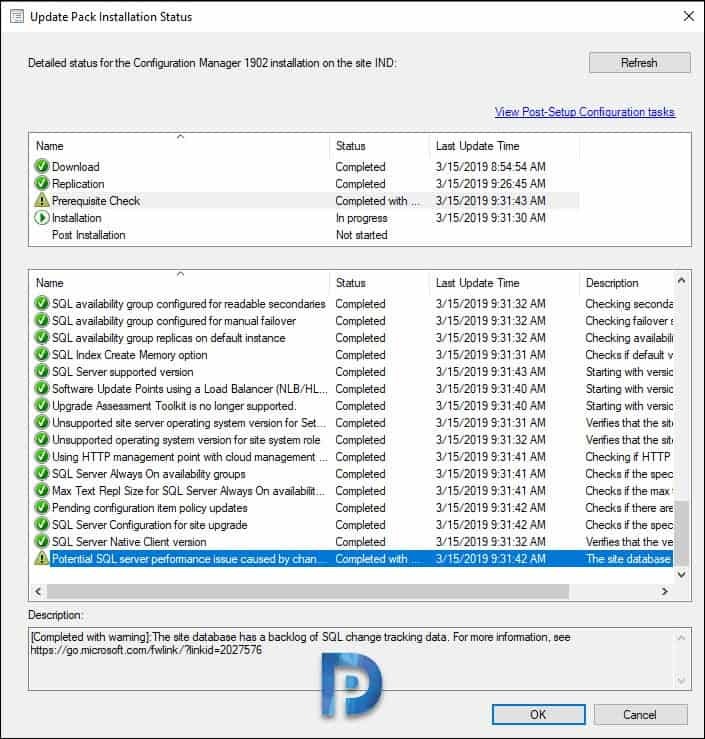 You can now see the detailed status for SCCM 1902 installation. Keep clicking Refresh button until you see all the steps marked with green check. After the update installation, it’s time to upgrade the SCCM console. Refresh the console or re-open the console. A box appears that says new version of console is available. The console will be upgraded from version 5.1810.1075.1700 to 5.1902.1085.1500. Click OK to begin the console upgrade. The console upgrade completed successfully. Click on drop-down at top left and click About Configuration Manager. This should show following details. To upgrade SCCM client agents to latest version. Go to Administration > Site Configuration > Sites. Click the Hierarchy Settings on top ribbon. 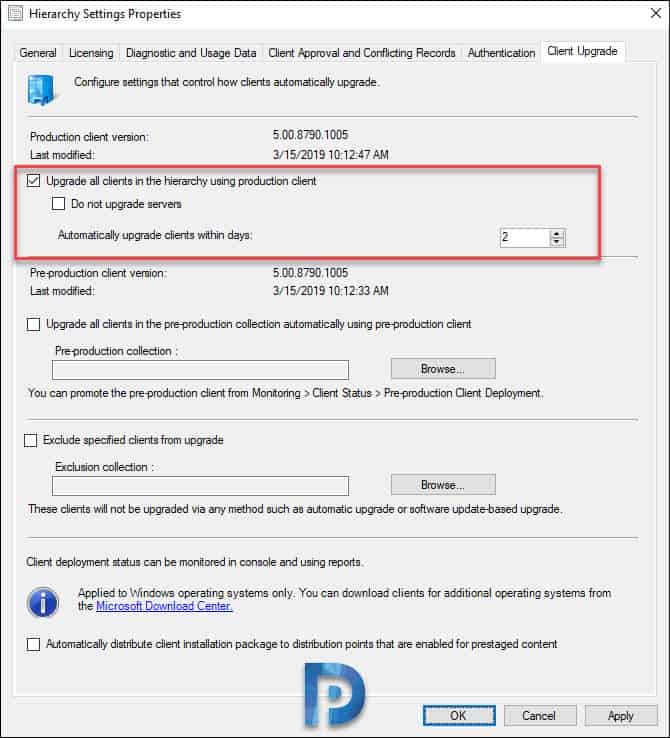 Make sure that Upgrade all clients in hierarchy using production client box is selected. You also also choose to not upgrade servers. Agent upgrade has begun and I see the new client agent version under Configuration Manager properties. 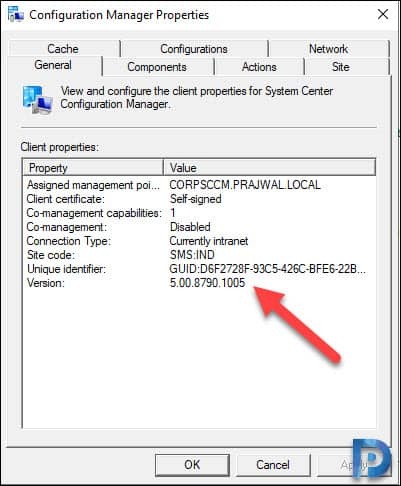 You can use the below query to find out the devices without the latest SCCM client version 5.00.8790.1005. Microsoft released the first SCCM version i.e. SCCM 1902 today. 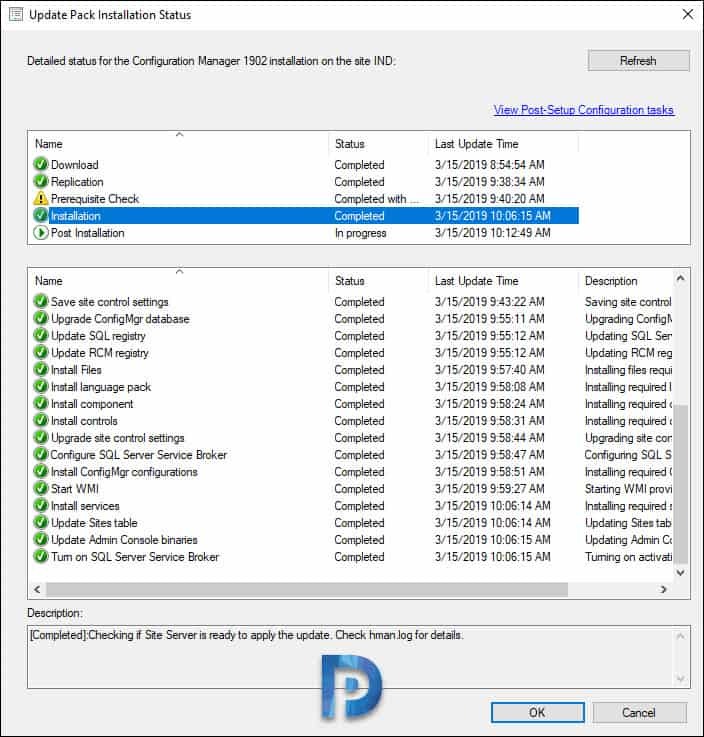 The Configuration Manager 1902 is out and comes loaded with new features and improvements over SCCM 1810. Most of all you can begin upgrading your SCCM current branch setup to version 1902. The link to the PowerShell script to run the fast ring update for 1902 is stating it hasn’t been published yet. Does anyone know if this has been pulled from TechNet for some reason? The link is removed because the script isn’t required anymore. The 1902 update is GA. Always appreciate your articles, Thanks. Do you know of any challenges going from 1806 to 1902 (i.e. Collection issue)? I haven’t heard of any collection related issues but 1902 upgrade should fix all the issues present in 1806. Very latest article. Good to know all details. I have SCCM 1706 with Hotfix Rollup KB4042949 installed in my environment and I want to start Windows 10 1809 upgrade, but just got to know that I need to upgrade my SCCM version first. Can you please advise how exactly I should deal with this? Can I directly upgrade from SCCM 1706 to 1902? To install ConfigMgr 1902 update, you must have installed at least SCCM 1710, SCCM 1802 SCCM 1806 or SCCM 1810. So i think you need to upgrade your SCCM to 1706 and then you can perform the direct upgrade to 1902. Where did you get the information that says it is possible to upgrade to 1902 from 1710? I was just told by a Microsoft PFE that I would have to upgrade to 1810 first before going to 1902. I have updated the post. You can apply this update on sites that run version 1802, 1806, or 1810. Nice post. Might be an idea to provide a link to the new features. Thanks Tuna. 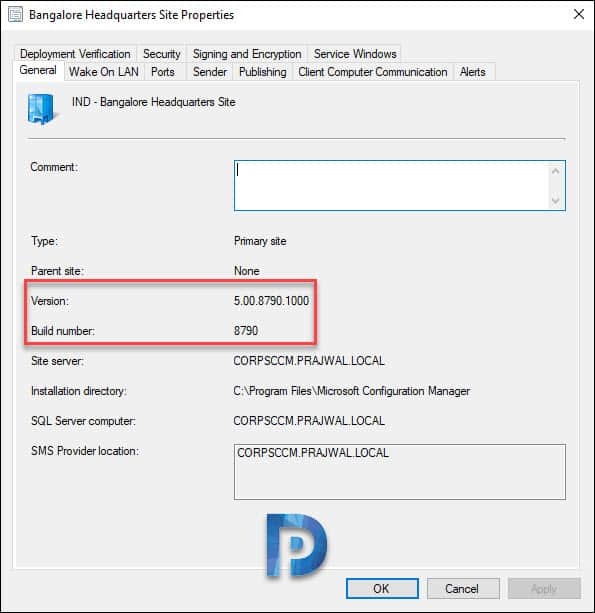 I have added the link in the post and there is a separate post published on SCCM 1902 new features.